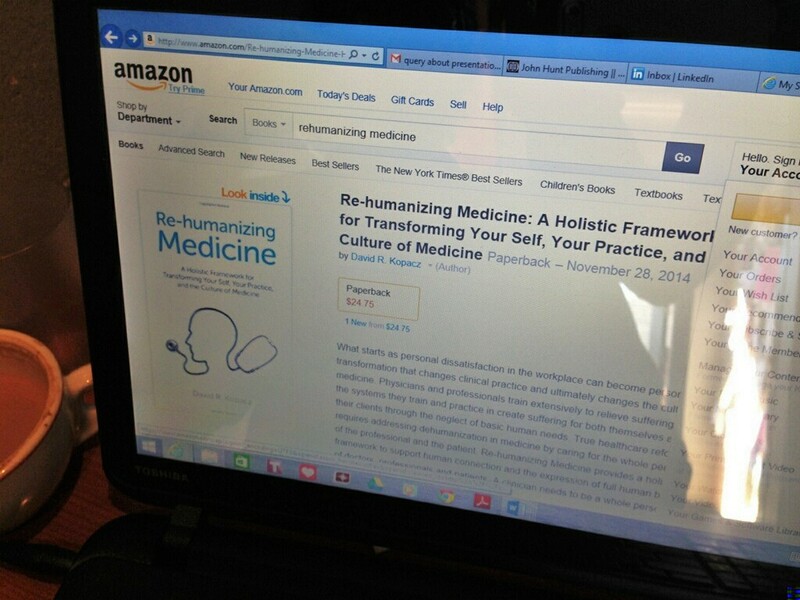 Re-humanizing Medicine is available for pre-order on Amazon! It is very strange to see something I have been working on for so long posted on Amazon. You can even look inside the book. The publication date is still set for November 28, 2014, but you can now pre-order the book. It is difficult to say when this journey began, particularly as I distill my professional life’s work in the book. I think it was probably around 2006 where the book started to take shape as Creating A Holistic Medical Practice. I had written a draft of a book I was calling Being Your Self, but it was kind of diffuse and unfocused, gradually I realized I wanted to write about my views on holistic medicine and my work in creating a holistic medical practice. My earliest memory of working on this book was when I was at the American Holistic Medicine Association conference in 2006 in St. Paul, Minnesota. I remember sitting at a café and distilling some of my thoughts about how the structure of a holistic practice differed from a conventional practice. 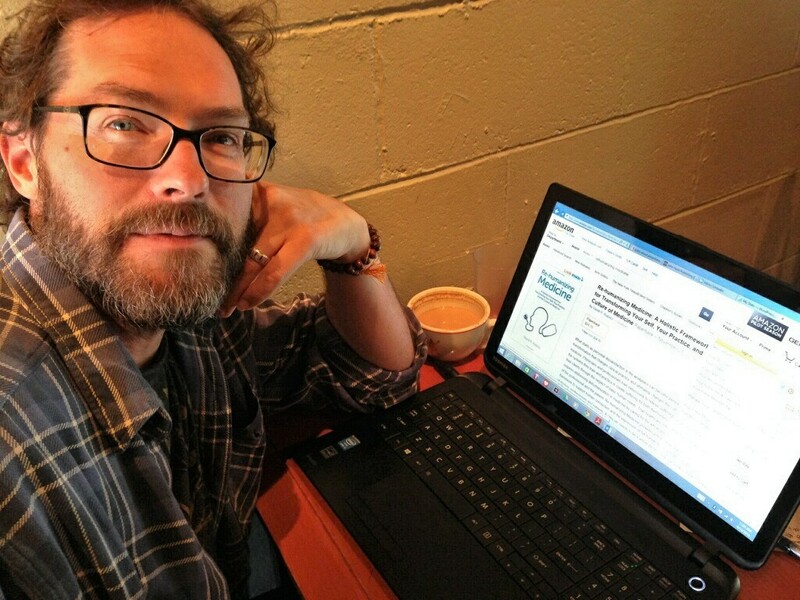 I had started my private practice in 2005, so I had been spending a lot of time thinking about and creating systems that supported genuine human connection in a psychiatric setting. I had set out some time in my private practice for writing, but clinical and then teaching demands intervened and the book languished. I wrote material for the classes I taught, Finding Your Self and Being Fully Human. I moved to New Zealand as part of the culmination of a long-term dream and compulsion. I became busy there at my first job, realized I was partly living my dream, but that I needed dedicated time for my book, so when I took my second job there, at Buchanan Rehabilitation Centre, I went down to 4 days a week, so that I had Tuesdays set aside for what was most important to me. It was then that things really started happening! The book really started to take shape. I started looking into agents and publishers, eventually landed a contract with Ayni Books through John Hunt Publishing. In the process of getting book endorsements, Vincent Di Stefano mentioned the phrase “re-humanizing medicine” and that really clicked. That is where my passion was, not just in a book on creating a practice, but on challenging the dehumanization in contemporary medicine and setting out a program of re-humanization. Phrases like “counter-curriculum” and “compassion revolution” came together and the book took on its current shape, after an extensive re-write. Also, I figured out how to bring myself into the book, or the book out of me. Instead of giving facts and information, I felt the book was a part of me and I of it. At this stage, the writing of the book served an integrative process for myself, bringing together the first research project I worked on with Deb Klamen (who wrote the foreword to the book) as well as the many side projects I worked on along the way. Eight years later, the book is now going public and I am shifting into a new phase with it. 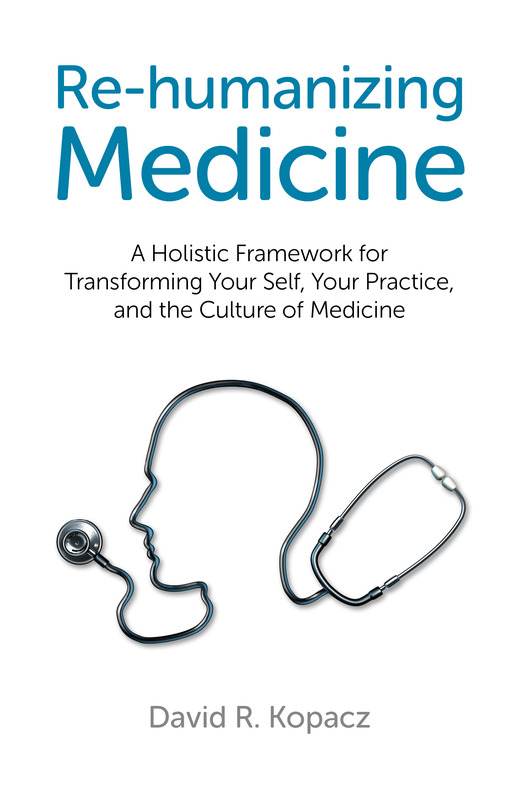 It is very exciting and I hope that the book resonates with an unmet need for physicians and clinicians and helps re-chart an inner direction that leads to outer transformation and reform. What will happen next? What starts as personal dissatisfaction in the workplace can become personal transformation that changes clinical practice and ultimately changes the culture of medicine. Physicians and professionals train extensively to relieve suffering. Yet the systems they train and practice in create suffering for both themselves and their clients through the neglect of basic human needs. True healthcare reform requires addressing dehumanization in medicine by caring for the whole person of the professional and the patient. Larry Dossey, M.D., author of One Mind, Reinventing Medicine and Healing Words; executive editor of Explore: The Journal of Science and Healing. Stevan M. Weine, M.D., author of When History is a Nightmare and Testimony after Trauma; director, International Center on Responses to Catastrophes, University of Illinois at Chicago. This entry was posted in Being Fully Human, Being in the World, Creating Human Culture, News & Events, Re-humanizing Medicine and tagged Re-humanizing Medicine book, writing. Bookmark the permalink.